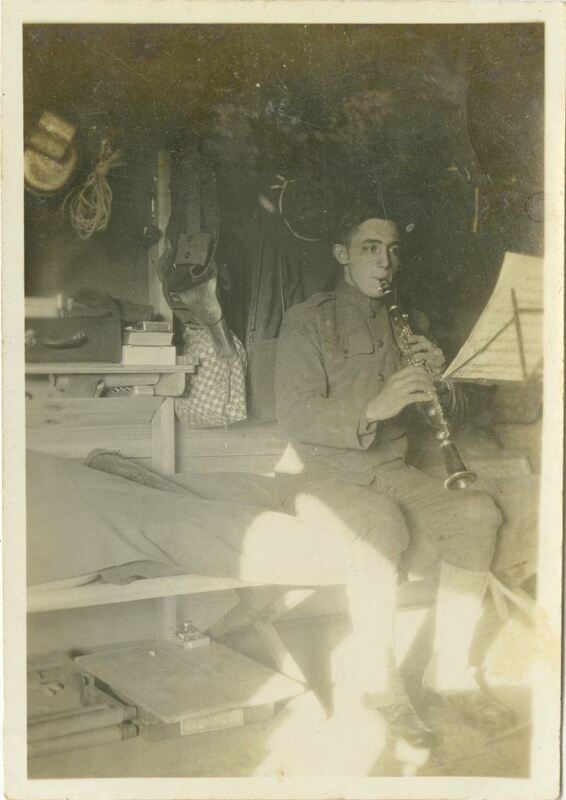 Charles Ernest Gormley, an American soldier, playing the clarinet during World War I. Gormley was originally from Kansas, but he moved to Sanford, Florida, with his family shortly before WWI. 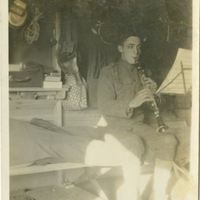 Gormley served alongside his brother, George Gormley, in France from August 13, 1917, to April 14, 1919. His daughter, Luticia "Tish" Gormley Lee, was the contributor of this photograph. Before entering World War I, the United States maintained a policy of neutrality, although the U.S. continued to supply the Allies: Great Britan, France, and Russia. The U.S. officially entered the war on April 6, 1917, in response to Germany's return to all-out submarine warfare on all commercial ships sailing for Great Britain and Germany's offer for military alliance to Mexico via the Zimmerman Telegram. The U.S. mobilized over four million military personnel through the course of American involvement in the war and lost 110,000 casualties. The U.S. vastly expanded its government and dramatically increase the size of its military during World War I. Original 2.25 x 3.25 inch black and white photograph: Private Collection of Luticia "Tish" Gormley Lee. Reprinted 4 x 6 inch black and white photograph, February 6, 2007. Digital reproduction of original 2.25 x 3.25 inch black and white photograph. Digital reproduction of reprinted 4 x 6 inch black and white photograph, February 6, 2007. Inherited by Luticia "Tish" Gormley Lee. Copyright to this resource is held by Luticia "Tish" Gormley Lee and is provided here by RICHES of Central Florida for educational purposes only. Keith, Jeanette. Rich Man's War, Poor Man's Fight: Race, Class, and Power in the Rural South During the First World War. Chapel Hill: University of North Carolina Press, 2004. Carlisle, Rodney P. Sovereignty at Sea U.S. Merchant Ships and American Entry into World War I. Gainesville: University Press of Florida, 2009. 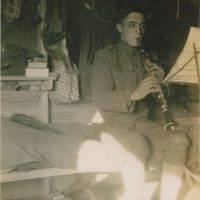 “Charles Ernest Gormley Playing the Clarinet During World War I.” RICHES of Central Florida accessed April 23, 2019, https://richesmi.cah.ucf.edu/omeka/items/show/3081.